1 of 3 Heat oven to 400 degrees . In a very large bowl, toss kale with 3 tbsp of the olive oil, 1/2 tsp of the salt and 1/4 tsp of the pepper. Distribute between 2 rimmed baking sheets. Roast at 400 degrees for 10 minutes. Stir with tongs and alternate location of baking sheets. Roast another 5 minutes, until some pieces are crispy. 2 of 3 Meanwhile, make dressing: Whisk remaining 2 tbsp olive oil, vinegar, mayonnaise, poppy seeds, sugar and 1/4 tsp of the salt. 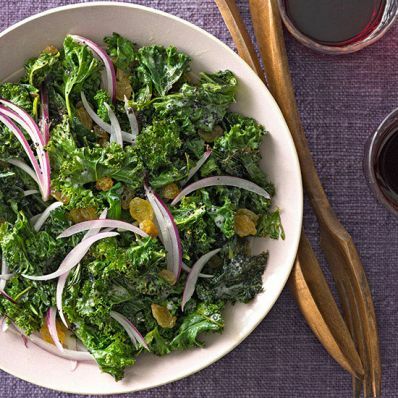 3 of 3 Toss cooked kale with raisins, onion, dressing, remaining 1/8 tsp salt and remaining 1/8 tsp pepper. 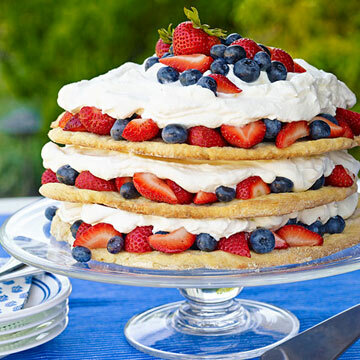 Per Serving: 1 g sat. fat, 1 mg chol., 10 g Fat, total, 310 mg sodium, 4 g pro., 3 g fiber, 26 g carb., 196 kcal cal.